Soap Cities Poll: Ravi and Ashley--Hot or Not? Let us Know! 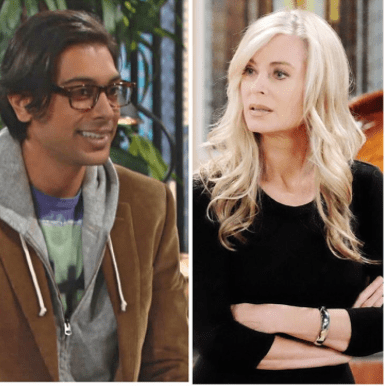 Soap Cities Poll: Ravi and Ashley–Hot or Not? Ravi and Ashley are shaping up to the the most unexpected, delightful couple-to-be on The Young and the Restless, in no small part to the smokin’ chemistry between Eieleen Davidson and Abhi Sinha. We at Soap Cities happen to think Ashley (Eileen Davidson) and Ravi (Abhi Sinha) are so cute. Their will-they-or-won’t-they dance is deliciously torturous. We think they could be the new power couple at Jabot–lovers and colleagues, the hottest kind of couple. Of course, this could make for a lot of complications for the two. It’s not always the best idea to mix business and pleasure. Of course that’s never stopped anyone on soaps, right? These two might just be the ones to make it work, though! Now some of you viewers think Ashley and Ravi have no chemistry at all. You think Ravi is just another one of Ashley’s cerebral, potential love interests, and while she may have a thing for him, she’s not in it for the long haul–even if Ravi seems to wanna make a go of things. Still other Y&R viewers aren’t all that invested in Ashley and Ravi. You think they make good business partners, but that’s it. You don’t want them to mess up their professional collaboration by becoming paramours. So, we have a poll that will hopefully satisfy all of you, whether you want Ravi and Ashley together, apart, or you could go either way. Let us know what you think, and vote in our poll below. Do you think Ravi and Ashley Are Hot...Or Not?